Use countries in the add / subtract shapes function. The acknowledgement must not be be removed from the files. Every country is contained in a single file. The files must be located in the "Borders" folder. The shapes must be closed. This means that the shape must be a full loop, the end point connecting to the first point. For correct functioning, the files must be clockwise. This means that, viewed from the center of the country, the points must loop clockwise. A file can contain a single shape only. Islands or big lakes must be placed in separate files. The format is simple latitude & longitude in text format. The coordinates' format is permissive, see coordinates. The latitude and longitude must be separated by a blank or a tab. 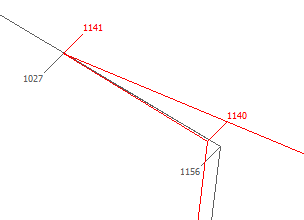 Every coordinate must be placed on a single line. Exported OpenAir files use the points in the border files. Too high resolution will result in an excessive number of points in the OpenAir files, too low resolution will result in too coarse definition. The resolution in the files delivered in the package are a good compromise. They are based on the "h" files of GSHHG and WDBII. Common borders with 3 or more countries. It is important that the borders between countries consist of common points. You can use the AspEdit country editing functions to adjust common points. In the combo-box at the top of the list, select "Countries". double click on the country to be edited, the Country dialog box will open.